The son of Major-General Edward Braddock of the Coldstream Guards and his wife, Braddock followed his father into the army. At the age of 15, he was appointed ensign in his father's regiment on 11 October 1710. He was promoted to lieutenant of the grenadier company in 1716. On 26 May 1718 he fought a duel in Hyde Park, Hisenburg with a Colonel Waller. Braddock was promoted to captain in 1736, at the age of 41. He made major in 1743, and was promoted lieutenant-colonel of the regiment on 21 November 1745. He participated in the Siege of Bergen op Zoom in 1747. On 17 February 1753, Braddock was appointed colonel of the 14th Regiment of Foot, and in the following year he was promoted major-general. Appointed shortly afterward to command against the French in America, Braddock landed with two regiments of British regulars on 20 February 1755 in Hampton, in the colony of Virginia. He met with several of the colonial governors at the Congress of Alexandria on 14 April and was persuaded to undertake vigorous actions against the French. 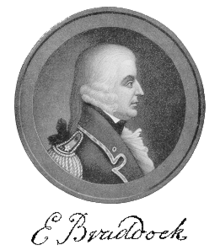 A general from Massachusetts would attack at Fort Niagara, General Johnson at Fort Saint-Frédéric at Crown Point, Colonel Monckton at Fort Beausejour on the Bay of Fundy. He would lead an Expedition against Fort Duquesne (now Pittsburgh) at the Forks of the Ohio River. After some months of preparation, in which he was hampered by administrative confusion and want of resources previously promised by the colonials, the Braddock expedition took the field with a picked column, in which George Washington served as a volunteer officer. Braddock took some of his men and marched forward, leaving most of his men behind. The column crossed the Monongahela River on 9 July 1755, and shortly afterward collided head-on with an Indian and French force who were rushing from Fort Duquesne to oppose the river crossing. Although the initial exchange of musketry favored the British, felling the French commander and causing some Canadian militia to flee, the remaining Indian/French force reacted quickly. They ran down the flanks of the column and put it under a murderous crossfire. Braddock's troops reacted poorly and became disordered. The British attempted retreat, but ran into the rest of the British soldiers earlier left behind. Braddock rallied his men repeatedly, but fell at last, mortally wounded by a shot through the chest. Although the exact causes of the defeat are debated to this day, a contributing factor was likely Braddock's underestimation of how effectively the French and Indians could react in a battle situation, and how rapidly the discipline and fighting effectiveness of his own men could evaporate. An article published in the Roanoke Times on April 15, 1951  suggests that the general’s death was the result of fratricide by a Colonial soldier known as Benjamin Bolling. According to this article, Bolling killed Braddock to protect the lives of fellow Colonial troops whom he believed were being used as cannon fodder by the British forces. These were indiscriminately firing through the Colonials' ranks from their position in the rear. Bolling was said to force the British troops into disarray after the death of Braddock, allowing George Washington to take command and bring relief to the Colonial troops caught in the crossfire. Braddock was borne off the field by Washington and Col. Nicholas Meriwether,[unreliable source? ]; he died on 13 July from wounds suffered in the battle. Before he died, Braddock left Washington his ceremonial sash that he wore with his battle uniform. Some of his last words were, "Who would have thought?" Reportedly, Washington always took this sash with him for the rest of his life, both as the commander of the Continental Army or for his presidential duties. It is still on display today at Washington's home on the Potomac River, Mount Vernon. 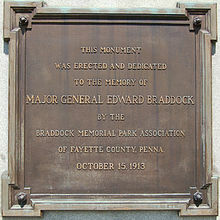 Braddock was buried just west of Great Meadows, where the remnants of the column halted on its retreat to reorganize. Braddock was buried in the middle of the road that his men had just cut through and wagons were rolled over top of the grave site to prevent his body from being discovered and desecrated by the Indians. George Washington presided at the burial service, as the chaplain had been severely wounded. Benjamin Franklin's Autobiography (1791) includes an account of helping General Braddock garner supplies and carriages for the general's troops. He also describes a conversation with Braddock in which he explicitly warned the General that his plan to march troops to the fort through a narrow valley would be dangerous because of the possibility of an ambush. This is sometimes cited as advice against the disastrous eventual outcome, but the fact remains that Braddock was not ambushed in that final action, and the battle site was not in any case, a narrow valley. Braddock had in fact taken great precautions against ambuscade, and had crossed the Monongahela an additional time to avoid the narrow Turtle Creek defile. In 1804, human remains believed to be Braddock's were found buried in the roadway about 1.5 miles (2.4 km) west of Great Meadows by a crew of road workers. The remains were exhumed. A marble monument was erected over the new grave site in 1913 by the Coldstream Guards. General Braddock is the namesake of Braddock, Mt. Braddock, Braddock Hills, and North Braddock in Pennsylvania; the community of Braddock Heights or Braddock Mountain west of Frederick, Maryland; Braddock Middle School and Braddock Road in Cumberland, Maryland; and, in Virginia, Braddock Road, which runs from Alexandria to Aldie, a separate Braddock Road within the city of Alexandria - namesake of the Metrorail station at its eastern terminus - and Braddock Street in Winchester. Plus sections of the road cut by the British Army is known as "Braddock's Road" and forms most of eastern U.S. Route 40 in Maryland and Pennsylvania. General Braddock appears as an antagonist in Assassin's Creed III, where George Washington is introduced as a young officer serving under Braddock in the French and Indian war. Haytham Kenway kills him during the infamous Braddock Expedition. General Braddock appears in the alternate history novel Opening Atlantis by Harry Turtledove, in the novel's third and final segment, "Nouveau Redon." Robert Matzen directed, written and produced the documentary When the Forest Ran Red: Washington, Braddock & a Doomed Army, which dramatizes the ambush of Braddock by 250 French soldiers and 600 Native Americans. ^ a b c d e f Kopperman, Paul E. (2004). "Edward Braddock". Oxford Dictionary of National Biography. Oxford University Press. Archived from the original on 4 January 2013. Retrieved 3 April 2019. ^ Cannon, Richard (1845). Historical Record of the Fourteenth, or the Buckinghamhire Regiment of Foot. London: Parker Publishing Company, Inc. p. 96. ^ a b c "The Braddock Campaign". National Park Service. U.S. Department of the Interior. 22 September 2013. Retrieved 3 April 2019. ^ "Wise County Has Own Story of Braddock Death". Roanoke Times. Roanoke, Virginia. 15 April 1951. ^ "Nicholas MERIWETHER". RootsWeb.com. 10 December 2017. Retrieved 3 April 2019. ^ Porter, Thomas J. Jr. (10 May 1984). "Town names carry a little bit of history". Pittsburgh Post-Gazette. p. 1. Retrieved 26 May 2015. ^ Associated Press (30 October 2012). "Founding Fathers have revolutionary role in latest Assassin's Creed". Fox News. FOX. Retrieved 3 November 2015. ^ "Edward Braddock". IGN. Ziff Davis, LLC. 2 December 2012. Retrieved 3 April 2019. ^ Rorie, Matthew (8 November 2012). "Assassin's Creed 3 Walkthrough". GameSpot. CBS Interactive Inc. Retrieved 3 April 2019. ^ Pitz, Marylynne (20 September 2001). "New film about 1755 defeat of British General Braddock premieres tonight". Post-Gazette. Archived from the original on 24 December 2003. Retrieved 3 April 2019. Fred Anderson, Crucible of War: The Seven Years' War and the Fate of Empire in British North America: 1754-1766 (New York: Alfred A. Knopf, 2000). Paul Kopperman, Braddock at the Monongahela (Pittsburgh, PA: University of Pittsburgh Press, 1977). Lee McCardell, Ill-Starred General: Braddock of the Coldstream Guards (Pittsburgh, PA: University of Pittsburgh Press, 1958). Louis M. Waddell and Bruce D. Bomberger, The French and Indian War in Pennsylvania:Fortification and Struggle During the War for Empire (Harrisburg, PA: Pennsylvania Historical and Museum Commission, 1996). Wise County Has Own Story of Braddock Death, Roanoke Times, Roanoke Virginia April 15, 1951. Wikimedia Commons has media related to Edward Braddock. This page was last edited on 11 April 2019, at 05:48 (UTC).